Here at Everything But Flowers, we combine gourmet foods with the finest wine, beer and spirits sourced both locally and internationally. Are you craving a sweet treat, a quick nibble or a gorgeous glass of white? We make every effort to have stock available of all items, however in certain circumstances where an item may not be available, Everything But Flowers reserve the right to substitute those products with a replacement item guaranteed to be equal or greater value than the original item. Please be aware some of the packaging may no longer be available and whilst the product may be the same or similar, it may look different to the photograph on our website. When it comes to Food and Wine it has to be Gourmet. Whether you want a Brown Brothers Premium Red Wine Gift Pack, a Luxury Chocolate & Champagne Hamper. Or if you want some help cooking that gourmet food, pick up a BBQ Pizza Stone with Tray & Cutter or 20 Piece BBQ Tool Set to help. If you’re looking for Food and Wine Gifts, you can’t go wrong with Everything But Flowers. Wine drinking is one of the finest, most delicate pleasures. In order to savor every taste, wine tasting requires a lot of patience and endless years of practice. However, once wine tasting art is mastered, a pleasant journey in the world of flavors and aromas starts. When you take the baby steps of your wine exploration journey, the road is pretty complicated. Certain wine options are combined better with certain food categories. This is why starters face problem. They are not able to choose the proper wine for each occasion. Initially, wines are classified in two big groups, the red and the white varieties. The main difference between red and white wines is obviously color. Wine’s color is based on the type of procedure used. Generally speaking, any type of grapes creates clear white juice. The blood red color and the complex taste of red wine are due to red and black grapes’ skins, stems and seeds. Skins, stems and seeds contain chemical compounds that called tannins. Tannins create a heavier, even taster final product. Obviously, white wine is just fermented grape juice without woody bits or added grape byproducts. White wine taste is generally sweeter than red’s. There are many different red wine varieties, satisfying even the most demanding wine aficionado. The most famous red wine varieties are Merlot, Cabernet Sauvignon and Pinot Noir. Pinot Noir is a pretty conservative option, since Pinot Noir is light-bodied. It has fermented with few tannins, offering softer, silkier taste. Pinot Noir is ideal for any meal. On the contrary, Cabernet Sauvignon includes high alcohol levels because of the high amount of tannins. It has very rich taste, so Cabernet Sauvignon gets on well with strong tastes like steak, cheese and veal. Merlot varieties compromise the softness of Pinot Noir and the richness of Cabernet, creating a “fruitier” product. Pasta addicts swear that Merlot is the optimum option for eating pasta dishes, so there is no reason to doubt! After travelling around the magical world of red wine, it is about time to have a glass of white wine. The most widely known white wine varieties are Riesling, Fumé Blanc and Chardonnay. Riesling is the best wine option for exotic dishes such as Chinese and Indian. The sweet taste is accompanied with notes of peach or apricot. Fumé Blanc is light and acidic. Fumé Blanc wines are enhanced with herbs, so it adds value to many dishes. For this reason, Fumé Blanc wines are ideal for acidic flavors such as tomatoes, vinegar and lemon juice. It is also suitable for oily dishes like baked oily fish fillet. Finally, Chardonnay has a pretty elegant, buttery taste. The addition of vanilla creates an even more sophisticated taste. The most famous Chardonnay wine is Champagne. Clams and roast chicken are fantastically combined with Chardonnay wines. It is pretty impossible to remember all these combinations, isn’t it? The easier rule of thumb is to follow your intuition and your personal taste. If you are a rookie with few wine tastings under your belt, there are some easy general rules to follow. The best wines are produced in France, Italy and California, so play it safe and order a wine which comes from these territories. White meats such as fish and chicken are best accompanied with white wine, while red meats and sauces should be served with red wine. What Are Some Christmas Hampers Australia? Australian Christmas hampers are counted amongst the most popular gifts in the country; this is no surprise since these Australian Christmas hampers are packed with delicious Aussie products. Our Christmas hampers contain delicious chocolates and nibbles, but may also contain wine, champagne, and many other items that will go down well during the holiday season. 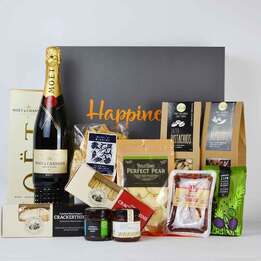 What Are the Best Gift Hampers for Special Occasions? The best gift hampers for special occasions are usually subject to your recipient, because the trick is to choose a hamper that fits your recipient perfectly. You can choose from a wide range of gourmet hampers, but also pamper hampers, BBQ gift sets, and other gift hampers that may prove a good gift for your recipient. What Are the Top Baby Hampers in Australia? At Everything but Flowers, you can find some of the best gift hampers in Australia; this includes some of the finest baby hampers. Some of the best baby hampers in our collection include the Thank You Co. Navy Baby Bath Hamper, the Jurlique All in White Baby Hamper, the Peter Rabbit Baby Hamper, the Pink Knit Blanket & Sophie Hamper, and What Little Boys Are Made of Hamper. Want to discover more of these top baby hampers? Check out our baby hamper selection today. Whatever option you choose, EverythingButFlowers.com.au is ready to suggest some of the finest wines of the market. Don’t forget, there is free delivery if you spend over $99! Trust our wines and relish your aromatic journey in wine tasting!